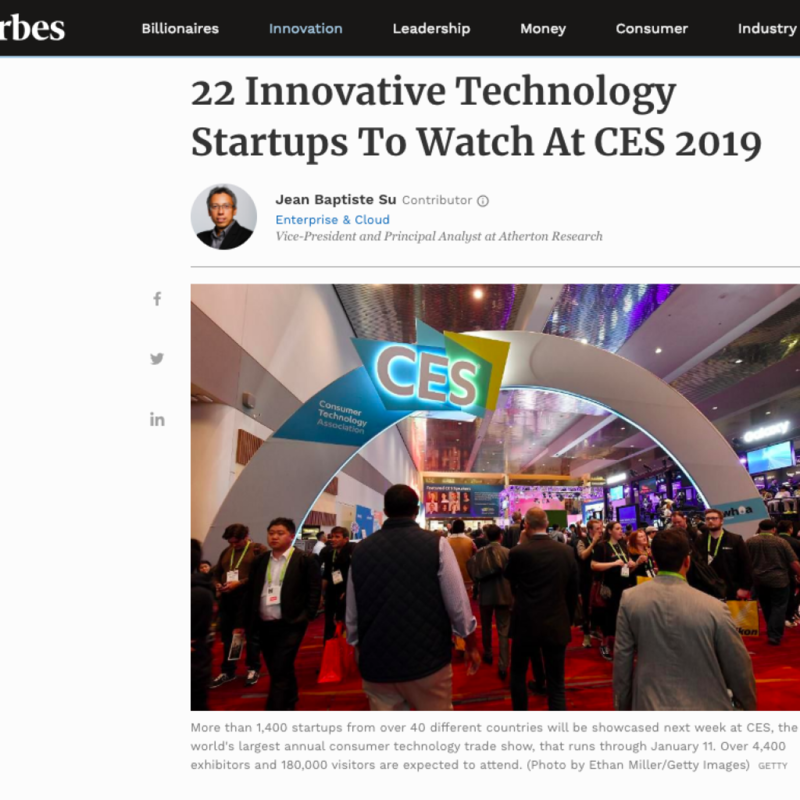 CES 2019 was jam-packed with activities and innovations that sprawled throughout Las Vegas with over 180,000 attendees, exhibitors, and speakers. The conference and exhibition activates across giant venues in Las Vegas including The Venetian, Sands Expo Center including startup innovation arena Eureka Park, and the Las Vegas Convention Center. 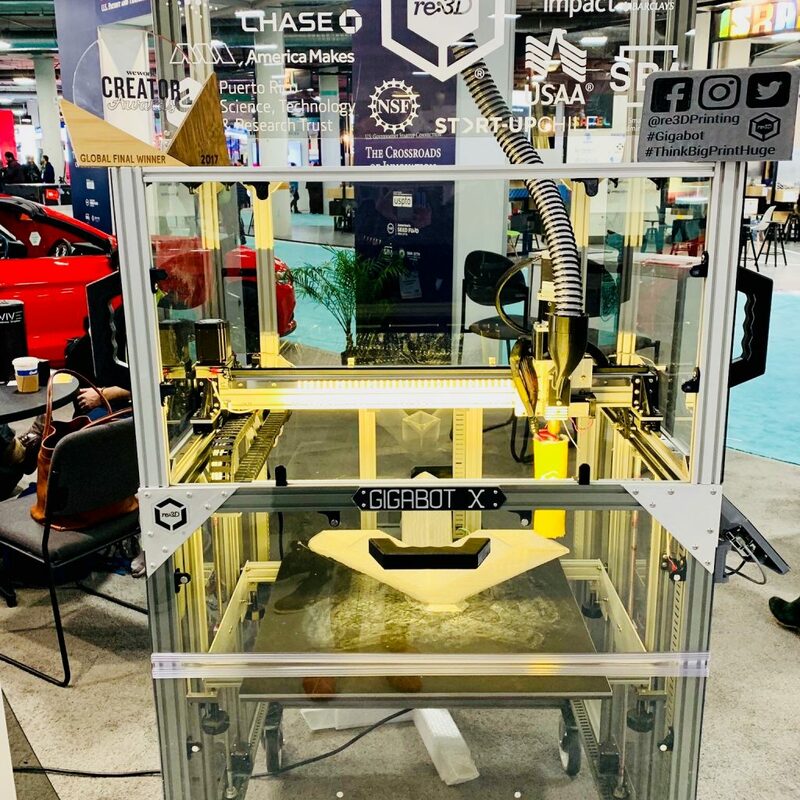 Companies and innovators on the spectrum of industries and size exhibited their latest work, from life-size drone helicopters, robots beating humans in ping pong, pretty much anything “smart” you can imagine or yours truly, showing our large scale 3D printer printing from plastic waste. We posted some insights on our schedule and first day at CES and here is the remainder of our insights, adventures, and recap of our first CES experience. 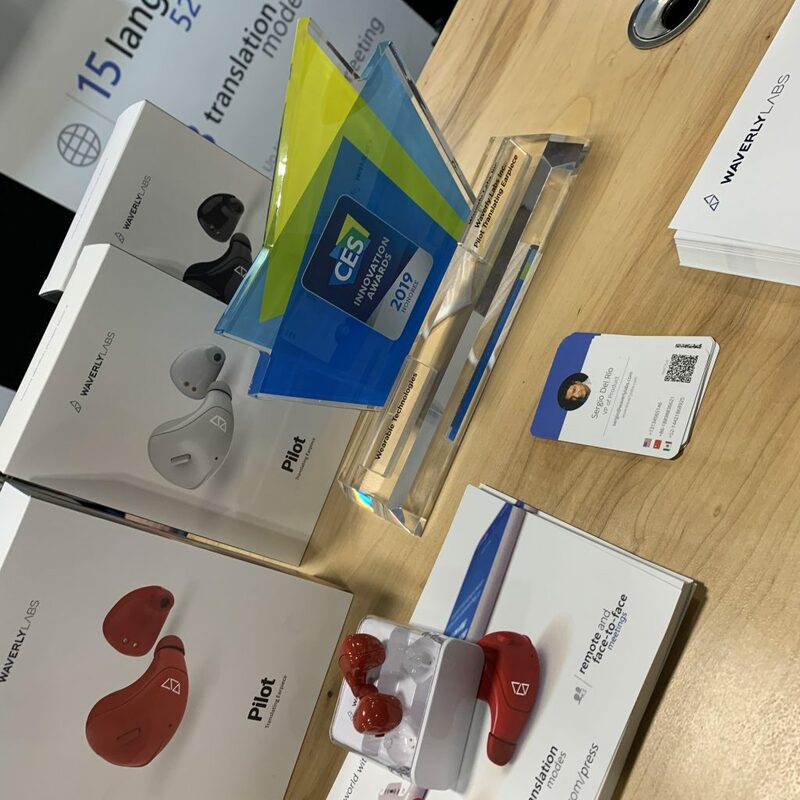 All in all, CES was about convening community from around the world to showcase and connect over their latest innovations and we wanted to write a recap and thank you note to our community who have supported ours. 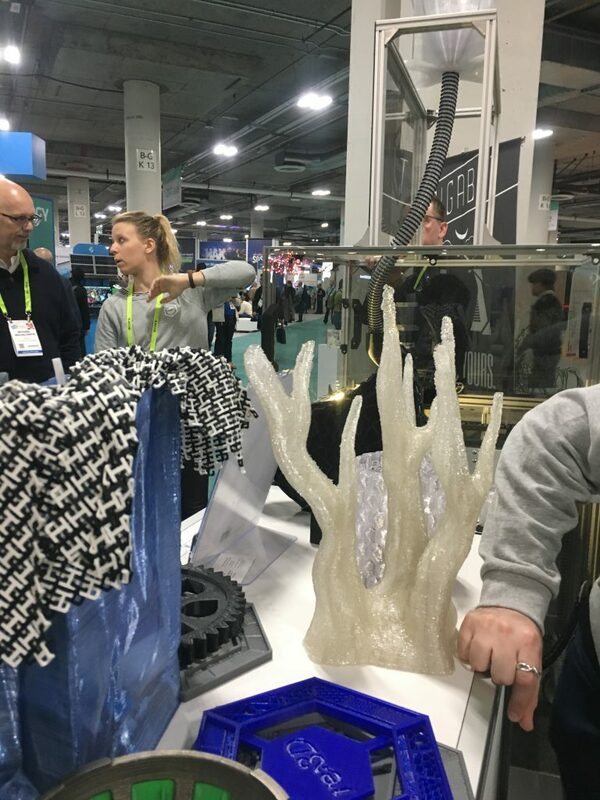 Our debut at CES 2019 wouldn’t have been possible without instrumental partners who gave us platforms to exhibit our new technology, Gigabot X. Gigabot X is a large scale (or large format if you prefer), affordable 3D printer printing from pellet or flake plastic. Pellet printing in and of itself drastically lowers the cost to 3D printing 10 times and prints up to 13 times faster than other printers. Even more so, after various peer-reviewed research with Michigan Technological University – Gigabot X has been validated printing from multiple types of plastic waste in pellet and flake form. 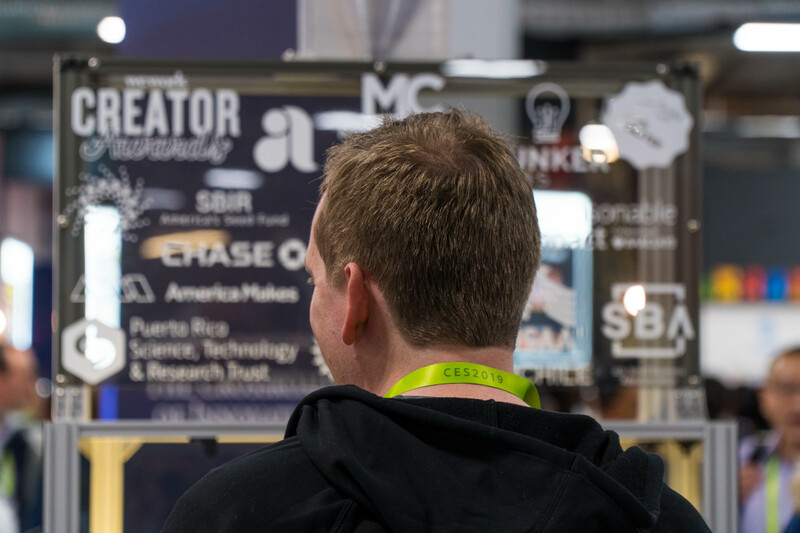 To showcase these developments almost exactly a year after we won the WeWork Creator Award and received funding from the NSF SBIR Phase I grant as well as launched Gigabot X on Kickstarter, it was a huge privilege to have our hard work on display to the global community who convenes at CES – meeting industry leaders, makers, fellow creators, and enthusiasts from all over. We also exhibited some Gigabot X and Gigabot prints such as 3D printed coral (straight from 3D scans of the Caribbean), a skateboard 3D printed from recycled plastic, vases, trashcans, architectural pieces, our infill educational tool, 3D printed medical devices, coffee picking baskets, prosthetics, replacement parts and more real-world examples of the innovations around the world, across industry, all with the commonality of solving problems utilizing Gigabot and 3D printing technology . 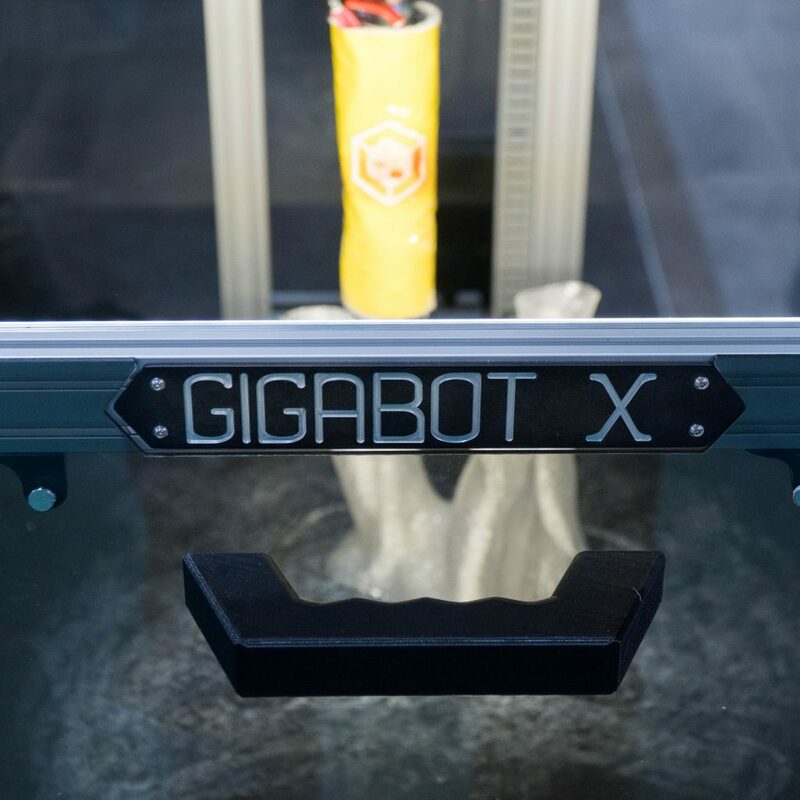 While we’re putting the final touches on Gigabot X before it’s commercially available, the positive feedback, inquiries, and pre-orders of Gigabot X were a major accomplishment of our time during CES. However, as a community-driven organization, this latest accomplishment wouldn’t have been made possible without a world of supporters (yourself included) and some of the major supporters who have gotten us to where we are today. This gratitude was proudly broadcasted across Gigabot X’s headboard (see below photo). 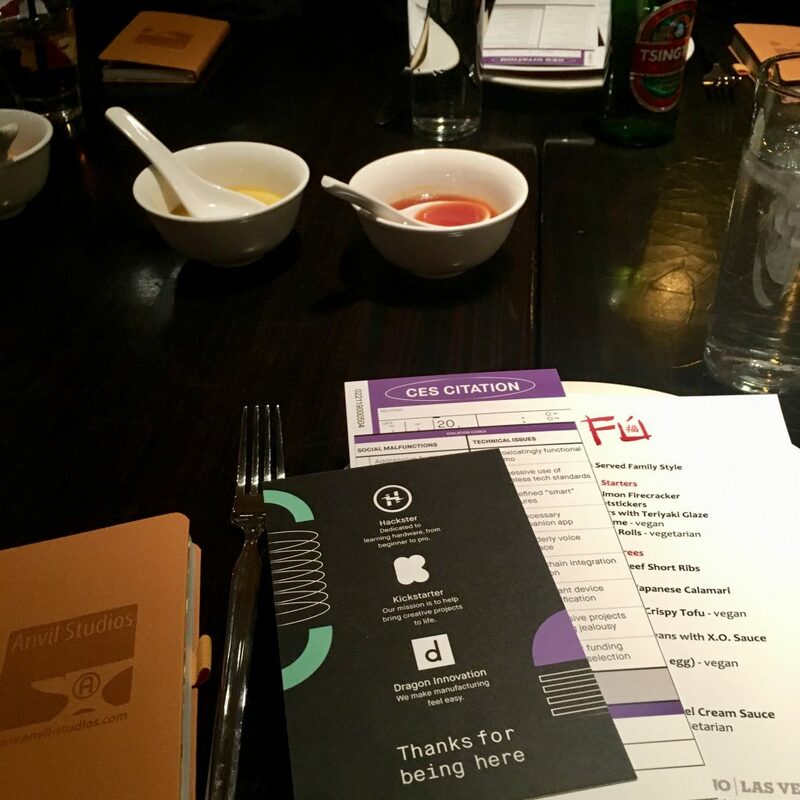 Beyond that, we wanted to write a recap and thank you note to CES and those who made it possible for us to be at CES, get to CES and showcase our vision. Thanks to National Science Foundation, Small Business Innovation Research, and Small Business Association not only for making the NSF SBIR grants available like the Phase 1 grant that helped make Gigabot X a reality but also for the support and partnership to showcase Gigabot X at the U.S. Government Startup connection booth in Eureka Park and ongoing support. We also got to meet other amazing organizations co-exhibiting in the U.S. Government Startup Connection booth like Ampaire on a mission to provide the world with all-electric powered commercial flights that are affordable, quiet and environmentally conscious, and Hivemapper, Learn With Socrates, and Gen X Comm. 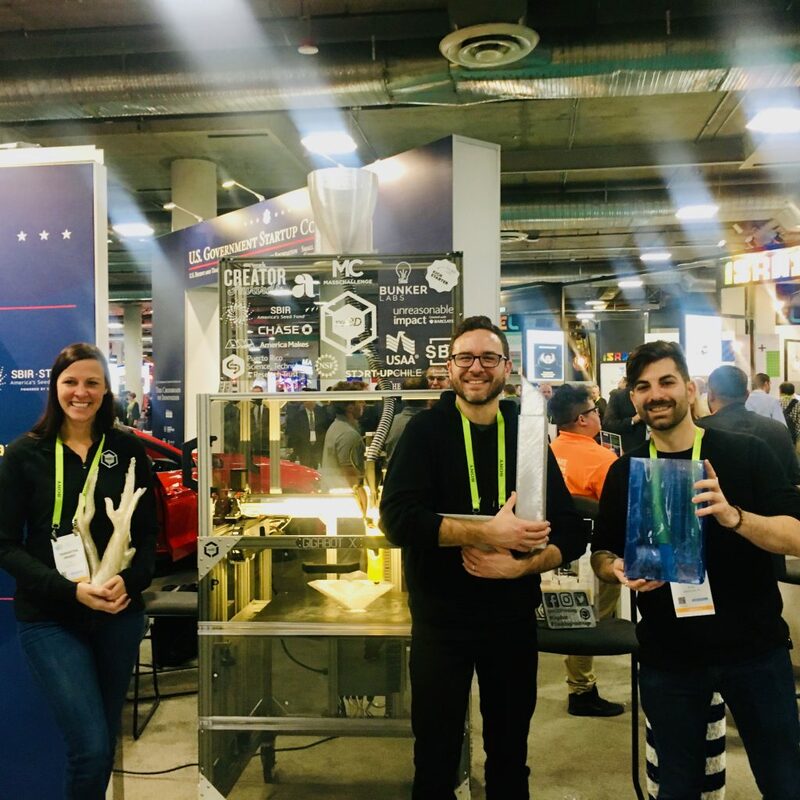 Despite the government shutdown which created some curveballs, our partners at NSF and SBIR were integral to our CES presence and getting to debut Gigabot X to the community. Thanks to USPTO for being there! Gigabot X’s headboard thanking WeWork, Bunker Labs, MassChallenge, Alice, Chase, SBA, SBIR, Unreasonable, USAA, Startup Chile, PRSTR Trust, Parallel18, NSF, America Makes, Kickstarter & others who made it possible! Connecting with WeWork and their Senior Construction Partner, Brian Ringley, at CES was another major milestone. The one year anniversary from when we won the $1M WeWork Global Creator Award occurred during CES and on the same day at CES, Brian met his new Gigabot X heading his way, one of the first to be delivered to Kickstarter backers from the successful launch last year. It was an amazing time to connect with Brian and celebrate this full circle collaboration: from winning the WeWork Creator Award to launching the Gigabot X prototype on Kickstarter to working together on Gigabot X’s the evolution from a beta bot to delivering it in person on perhaps one of the biggest platforms and convenings for electronics. We also got some great snapshots with Brian’s first print and his kickflips on our 3D printed skateboard from recycled plastic! 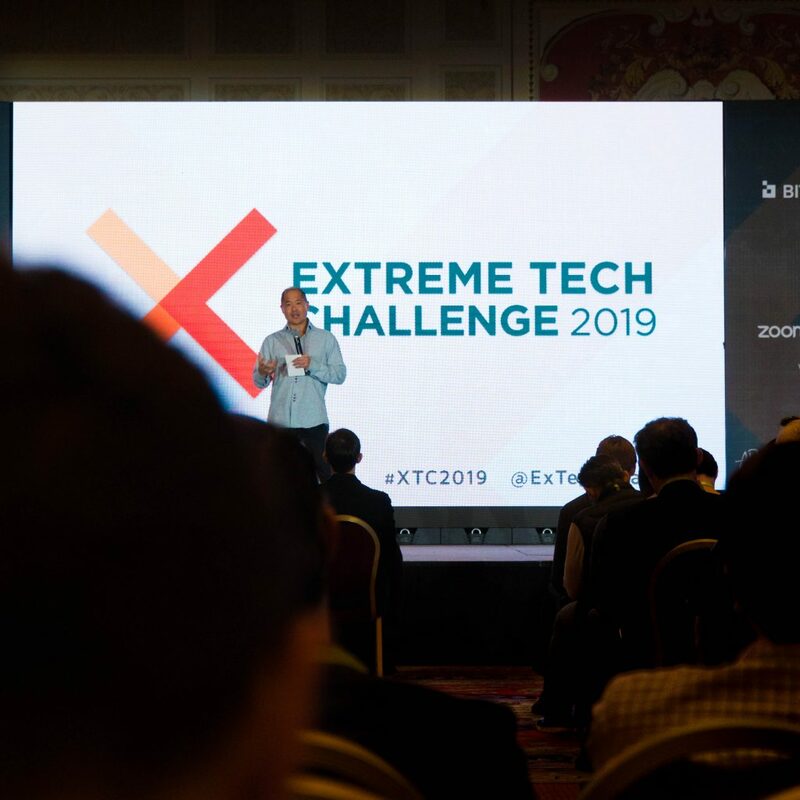 Taking the stage as a top 10 finalist in Richard Branson’s Extreme Tech Challenge was another major highlight of our CES experience. 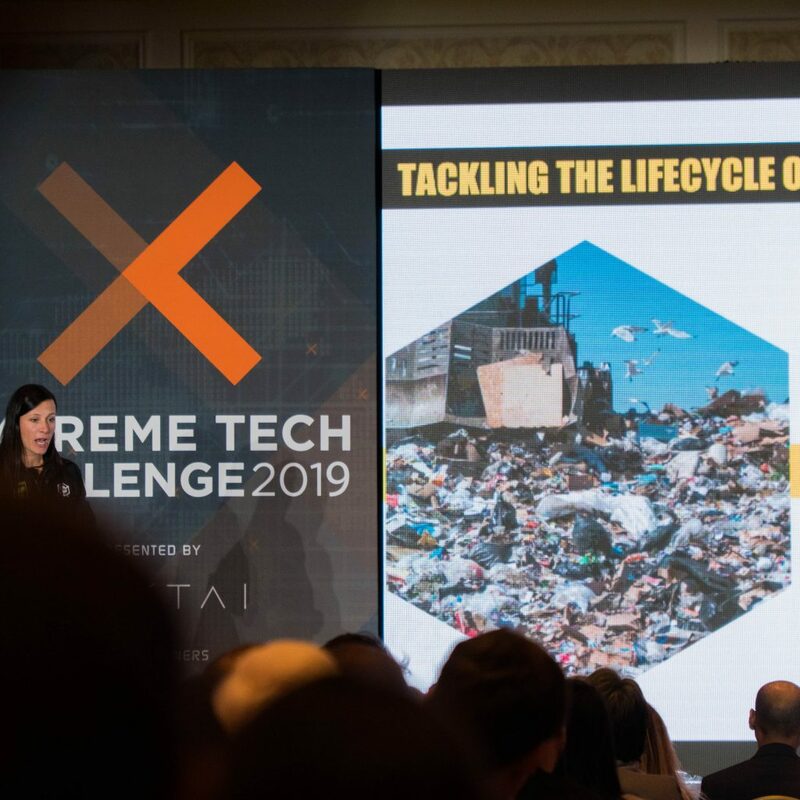 We have so much gratitude and admiration for Richard Branson, the other companies in this competition, the judges who gave us feedback, and the team from Extreme Tech and Actai who have supported us along the way. Making the top 10 of this global competition was a huge honor for us and we extend a huge congratulations to the top 3 winners from Lynq, Elevian, and Active Protective who won a trip to Necker Island as well as other semi finalists who received a surprise invite to Necker along with us! 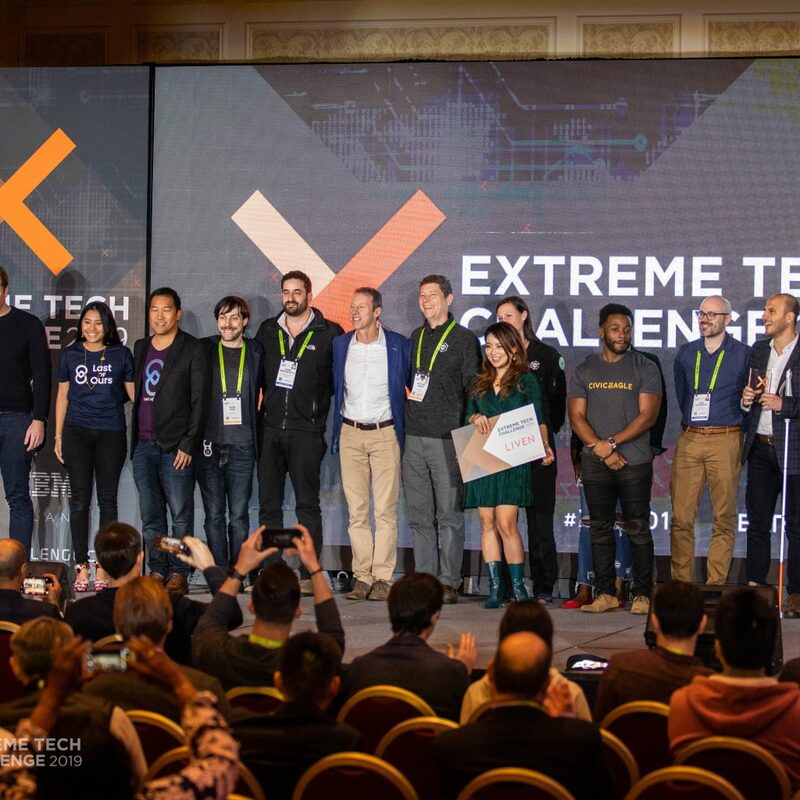 We look forward to future collaborations with this community and grateful for the stage and the setting to share our vision and demo Gigabot X.
Techstars likewise gave us a great platform on their #StartupStage to share our innovations in the robotics pitch competition in Eureka Park. After being selected as a top 10 from a number of applicants, we competed with a 60 second pitch and were humbled to take home 1st place and meet creators of cutting edge robotics and judges from Misty Robotics and Lynq. 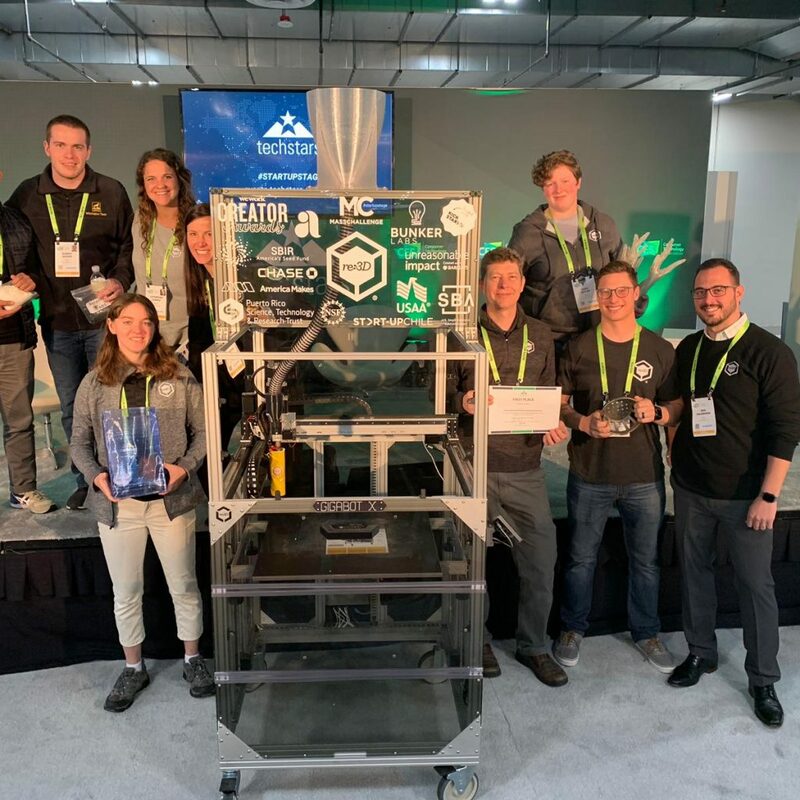 re:3D wins 1st prize at Techstars Robotics Pitch Competition! If you know our story, you know it begins with Kickstarter – and Kickstarter continues to be a key community partner and powerful platform that supports us as we launch new evolutions of the Gigabot family such as Gigabot X last year to its first beta users. 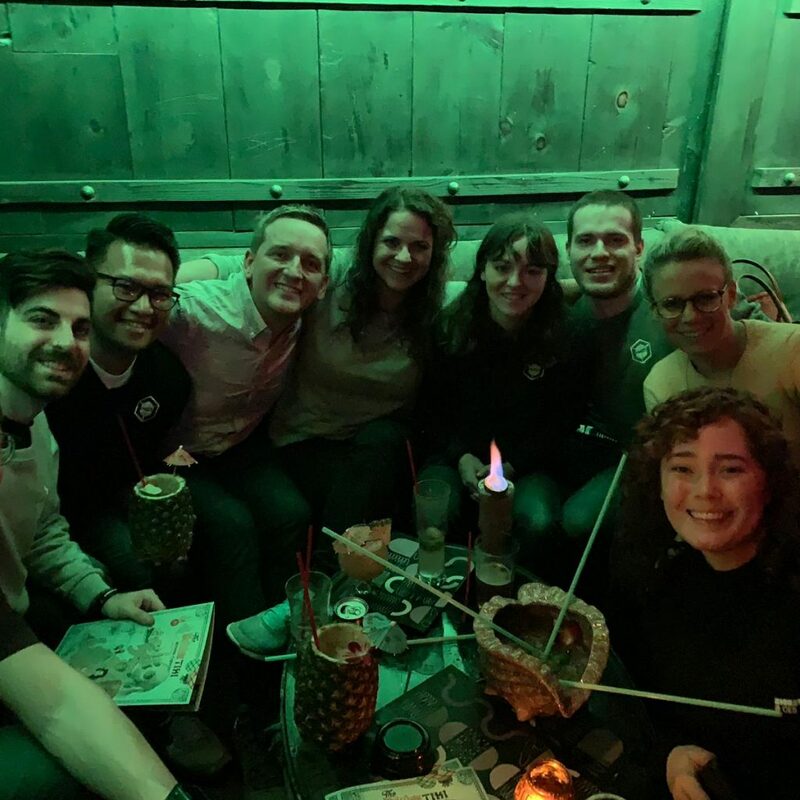 We were grateful to meet with the Kickstarter team, like Clarissa, and community at some amazing meetups after hours with a global network of creators and partners like Hackster and Dragon Innovation. We are forever grateful for our friends and supporters who have gotten to where we are today! 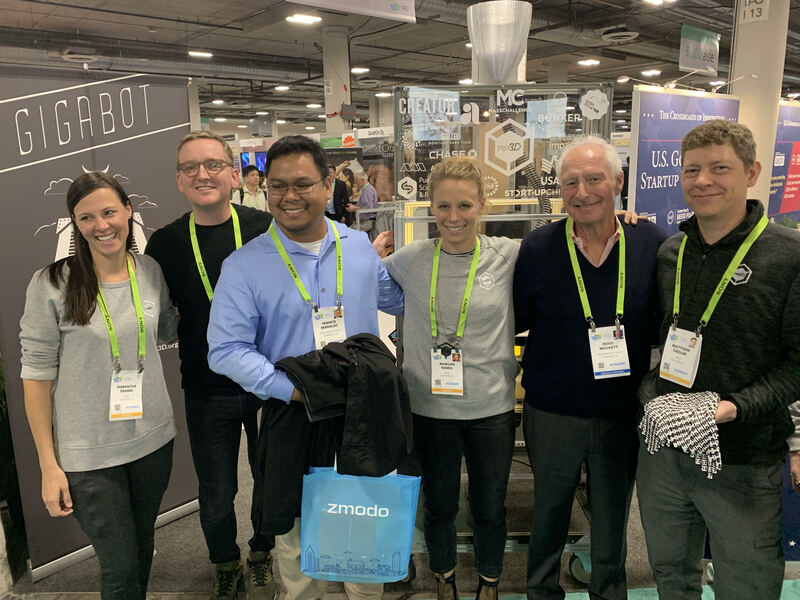 Arguably one of the proudest highlights of CES was reuniting with one of the first Gigabot owners, Doug Mockett of Mockett, who came to say hi to us at CES from California. Still to this day, their two Gigabots run around the clock and they lovingly call them their “workhorses”. We met up with some other customers (like one using Gigabot to 3D print entire life size inventory robots) and even suppliers like LDO Motors. We got to catch up with friends from former accelerators like Waverly Labs from Startup Chile, our first accelerator we joined when we launched in 2013. We met up with one of our mentors from Parallel 18, Alicia Syrett. We also said hi to fellow Unreasonable Impact alumni on a mission to create solutions and jobs in the green economy such as the teams from Heatworks and Breezometer exhibiting in Sands Halls. We spent one morning getting to tour the local Afwerx office in Las Vegas, an organization creating innovative and crowdsourced solutions for the most critical problems affecting those in our Air Force and an organization especially close to our heart with two teammates Samantha and Kara actively involved in the military and Air Force. We also got to see our partners at IEEE and Finn Partners at an evening event, some great partners who share aligned values with their mission to foster technological innovation and excellence for the benefit of humanity. A huge thank you as well to partners and press who acknowledged us in their pieces, we can’t say enough how grateful we are for your recognition. 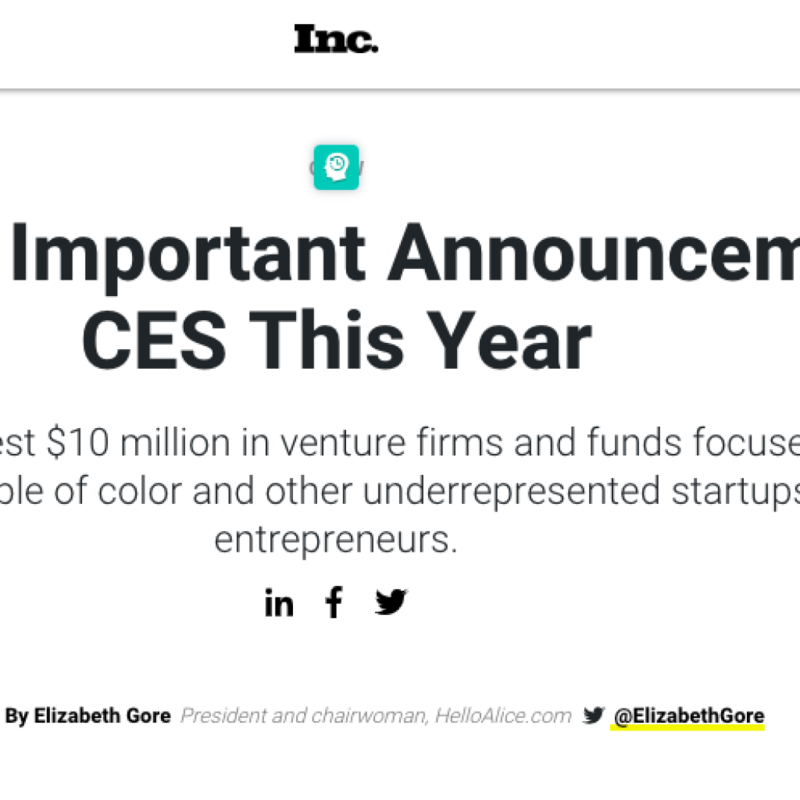 Alice’s Elizabeth Gore included us in an Inc article with a major announcement on the bright future of diversity in tech, Jean Baptiste Su noted us in Forbes top 22 innovative technology startups to watch at CES and Beau Jackson’s 3D printing round-up at CES in 3D Printing Industry gave us a nod. Thanks for these platforms and writers for sharing our story! We hope to continue to share more on our developments, diversity, and problem solvers around the world breaking limitations with 3D printing. p.s. If you were following our road trip to CES and are curious about the adventures of re:3D after official CES festivities, we packed up Gigabot X in our beloved Uhaul and headed back to Texas the way we came: 1,500 mile road trip. We traversed from Las Vegas to Tucson, then on to El Paso where w dropped off a Gigabot at the University of Texas El Paso’s W.M. Keck Center for (extremely rad) 3D Innovation in partnership with America Makes. We then took a break to rock climb at McKelligan Canyon in El Paso before heading back to Houston, Austin & San Antonio.